Vision Fitness Elliptical Reviews by Industry Experts! Vision Fitness S7100 Elliptical – Read full review here. We checked out several of the most popular Vision Fitness elliptical trainers when we were at the corporate headquarters in Cottage Grove, WI. Vision Fitness ellipticals are built by the same company that manufactures Horizon and Matrix Fitness. They have a reputation for building durable machines and it is a well deserved reputation. They also have some of the best customer service in the in the industry. Now customer service may not be one of your top priorities when purchasing fitness equipment, but when you need it you will appreciate a company that properly services their customers. Vision Fitness offers suspension ellipticals that are built for not only residential use, but also light commercial use. They have a uniquely designed elliptical motion focus on getting results. What Sets Vision Fitness Apart? Vertical Integration – Vision Fitness manufacturers their own machine components instead of using third-party parts. This results in better performing machines that require less maintenance. Strong Customer Service – We got to personally see the customer call center at the headquarters in Wisconsin. It is clear that they take this aspect of their business very seriously. 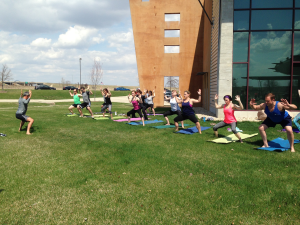 Company Culture – Johnson Fitness treats their employees very well with in-house fitness centers for the employees and wellness programs. A company that treats their employees well will treat their customers even better. Vision Fitness S7100 ($2,599) – This suspension elliptical has Perfect Stride technology for a very natural feeling workout. We got a chance to try this machine on our last visit to the Vision Fitness headquarters in Cottage Grove, WI. Honestly, it’s extremely smooth and comfortable. Probably one of the most comfortable ellipticals we’ve ever been on in fact. Along with 17 programs, it has has adjustable incline, unique Sprint 8 programming, and a Passport Media Player that allows users to hike or walk in scenic routes around the globe. 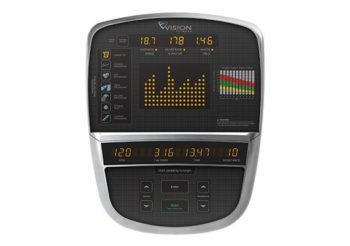 Vision Fitness S70 Elliptical Console – Read full review here. Vision Fitness S60 ($3,199) – This premium model suspension elliptical builds on all of the benefits of the already stellar S7100 model. This sturdy design is self-powered and can handle a user up to 400 lbs. It also has an extremely strong Lifetime frame warranty, 7 year parts, and 2 years labor. 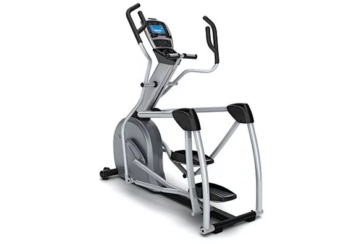 Vision Fitness S70 ($4,399) – The S70 has a larger adjustable 20-23″ stride length along with a 15-37% incline feature. The warranty has also been increased to Lifetime frame, 7 years brake, 10 year parts, and 2 years labor. As with the other Vision machines, it comes with Sprint 8 programming for maximum results. Talking to sales reps and general managers at different fitness equipment specialty stores the feedback was very positive. One sales rep described the Vision Fitness S7100 as “awesome”. Overall, they suggested the machines are very low maintenance, which is important because they retail stores provide their own customer service. Having been to the company headquarters, in addition to having numerous conversations with their employees it is clear that the parent company, Johnson Fitness, is on a mission to offer not only the best cross-trainers in the industry, but also to back it with unsurpassed customer service. In both categories we would say they are on track to achieve their business goals. This elliptical trainer is made of heavy-gauge steel and folds to less than 4 feet long, making it a nice fit for nearly any room. ‘In the past, folding machines meant poor quality,’ Allen says. ‘Times have definitely changed. This is a solid, smooth, quiet unit.’ The simple-to-decipher console offers five program options, in addition to displaying workout time, distance, calories burned, and three other types of workout feedback. The X6100 also has hand grips that detect your heart rate on contact and a reading rack in case you need a distraction. 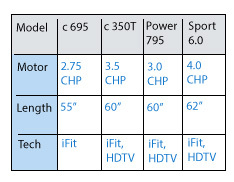 They gave the Vision X6200 average ratings, and rated several competitor models above it that cost considerably less. …the Vision Fitness X6200HRT…legs fold up vertically to save space–the motion was surprisingly smooth and quiet…offered compelling workout features… Great for small spaces…Best Buy Award Winner! Features on this low-priced (X6200HRT) elliptical trainer include programmable tension control, heart-rate-control programs and a well equipped console with 11 LEDs. S7200 HRT Suspension Elliptical – This is the best elliptical I have ever used, and that includes the two vision ellipticals I owned in the past and those Life Fitness and Precor’s I have used at health clubs. It is smooth, quiet and a pleasure to use. The most expensive elliptical I have ever bought also, but worth the money for a long time investment in one’s own health.